Dry or unproductive cough – this kind of cough does not bring up any mucus or phlegm, it may develop towards the end of an infection or be caused by mild irritants like dust, smoke, etc. Productive cough – unlike the dry cough, this cough brings up with it mucus and/or phlegm, causes may be infection, viral, use of tobacco, etc. Acute – that lasts for almost 3 weeks. This kind of cough is not much to worry about although the National Health Service, UK, suggests it could be an initial sign of a chronic cough. Chronic – that may last for more than 8 weeks. A cough that lasts this long may give cause for alarm and a detailed investigation of the same may be required. For the treatment of coughs caused by an illness or a viral, it is suggested not to use antibiotics as it can kill the good bacteria, but to let the body’s immune system take its course in dealing with the problem. Some natural remedies can be followed to provide symptomatic relief while the infection runs its course. 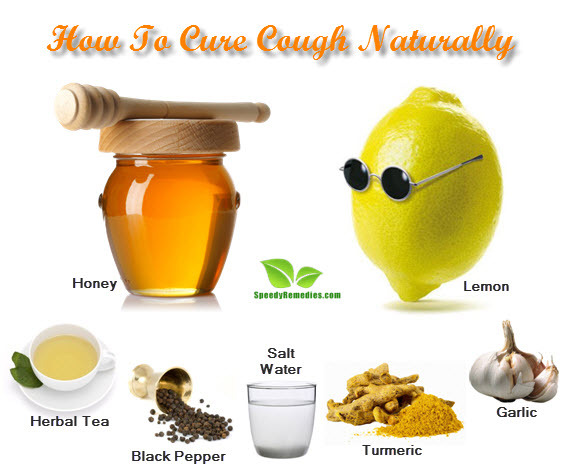 These remedies may prove to be better than the over-the-counter cough medicines available at the stores, as those medicines tend to suppress the cough which can result in a heavy and choked up feeling. Honey, known for its analgesic properties helps immensely in soothing a cough. It is also rich in bacteria and virus fighting components. A spoonful of honey may be added to any hot beverage and had at frequent intervals throughout the day. A mixture of 2 parts honey and 1 part lemon juice, blended together in hot water can also help soothe the throat and fight mucus; it can be taken at short intervals. Before going to bed two teaspoons of plain honey can be consumed to prevent the coughing bouts that may occur at night, thus hindering in a good night’s sleep. A teaspoon of honey may also be licked twice a day along with a generous pinch of black pepper, which can be added to the honey. Another very helpful concoction can be prepared with red onion and honey. Slice the onion and place the slices in a bowl layering honey between each slice, starting from the base of onion. Leave this overnight, and you will find sweet syrup in the morning that can be had to relieve cough. Turmeric powder can be added to a glass of warm water along with a dash of honey as another natural remedy against cough. Basil leaves, combined with ginger can be boiled together in a cup of water, let it simmer. Once it comes to a boil for about 5-10 minutes, strain the water in a cup, add a pinch of pepper and a teaspoon of honey. Drink this home medicine as many times as required to gain relief from cough. A tea prepared using lemon and some ginger will hydrate the body and act as a remedy against the cough. Boil tea leaves adding ginger to it and later add the lemon juice, sip it while it is hot. It is also suggested that lemon be boiled intact with the peel, before extracting the juice, this process may help get rid of certain enzymes that may not be favorable for consumption. The lemon once boiled can be squeezed to obtain the juice, which needs to be filtered before adding to a jar with about 60ml of honey. Refrigerate this mixture and have a teaspoon thrice a day. Lemon juice added to warm water and gargled can prove to be a good remedy against cough and aid in bringing out the phlegm, which may be causing a congested feeling in the chest. Add some salt to a glass of warm water and gargle with it to relieve an itchy, scratchy throat. Boil water an inhale the steam; you can add a half teaspoon of turmeric powder to the steaming water for a soothing effect. To boost the immune system, take 2-3 cloves of garlic, lightly crush them and boil them in two cups of water. Simmer the water for 10-15 minutes and pour into a cup using a strainer. Finally, add a teaspoon of honey, a pinch of pepper and some lemon juice in the solution. Drink it warm. For a speedy recovery from any infection, it is essential to get adequate rest, drink plenty of fluids, and avoid sugary and salty foods, along with dairy products and foods that contain starch as they may aggravate mucus buildup. Plus, maintain a healthy lifestyle, avoid tobacco intake, and use filtered masks in places where there may be heavy pollution.